Remember, life’s a picnic – or at least, it should be! If you are planning some picnics with your children this summer, why not make them extra special – by adding some arts and crafts activity to your regular day. Incorporating art into your picnic may sound like a wacky idea, but it actually can be loads of fun. Whether you are making a special picnic basket or decorating a picnic blanket, warm weather and creativity go hand in hand. Especially when you can be as messy as you want – outdoors. 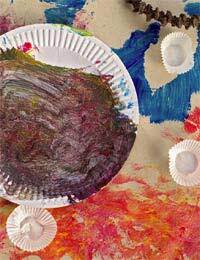 This is a fun one for younger kids who like to get messy. Get an old white sheet and spread it outside, then bring on the paints. Let the children draw their own picnic blanket, including plates, cutlery, cups, and food. Once it’s dry you can use it as a picnic blanket yourself! Fabric paints are best. Alternatively, get an old checked tablecloth and let the children cut out pictures of food from magazines. Once they have created a meal, give each one a paper plate and have them glue the food on to the plates. When you have finished, attach the plates to the tablecloth. They’ve created a full paper picnic of their own! No picnic is complete without ants, wasps and other insects. Small children can indulge their love of bugs by making thumbprints on white paper, then drawing arms, legs and faces to make their own ants. Brown thumbprints can be the basis for bees and wasps, while red ones can be magically transformed into ladybirds by cutting out black spots from black paper. Picnic basket and accessories can be quite pricey, so why not let your children make their own? Get a cardboard box, plastic tub or large (clean) bucket and let your toddler or small child decorate it with paint and stickers. When it’s dry, fill it up with goodies to take with you. Your children will love the fact that they made the basket themselves! Lion Plates: Cut out strips of brown and yellow paper to attach to top of plate as a “mane”, then glue on ears. Draw or paint a lion face in the middle. Cut out spaces for eyes if you want to turn your lion face into a mask. Fishy Shapes: Cut out a small triangle or pie shape, equivalent to one-eighth the size of the plate. Glue onto the side opposite the cut-out so it sticks out as a fish tail; the space you cut will now be the fish’s open mouth. Decorate the fish with eyes (sequins) and lots of glitter. Make a shark, if you wish, by gluing teeth protruding from the mouth. Cute Kitty: Paint one side of a paper plate and let dry. Draw or paint on face, add triangular pieces of coloured paper for ears. Glue on pipe cleaners for whiskers and you have a very convincing cat! Everyone loves pasta, especially children. Next time you plan a picnic, invite your children into the kitchen to help you make several pasta salads using different large pasta shapes, such a fusilli, pasta shells and ziti. Add different ingredients such as tomatoes, chopped pieces of sausage and cheese to make each salad different. Alternatively, you can also glue the pasta on the plates to make faces – brown shapes for hair, blue shapes for eyes, red for mouths. Let them use their imagination to make whatever they want! Children love to run around during a picnic, but picnic art is one nice way to engage them in a bit of quiet activity, and to get them thinking. Hopefully, these picnic arts and crafts ideas will spark your imagination – and theirs – and help make this summer an even better one.